Have you already packed up your fans, AC units, and summer dresses? Pulled out those cozy knit socks, sweaters, and had your pumpkin-flavored-whatevers? October is only 2 days away (I know, it's crazy) and it's time to start thinking about all things warm and cozy! 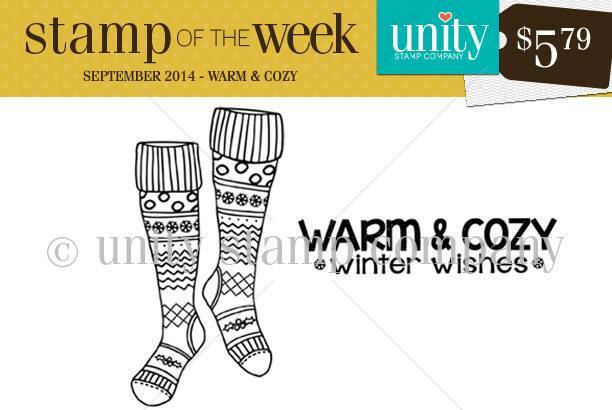 The new Unity Stamp of the Week "Warm and Cozy" will work with all of your winter and holiday themed cards. Don't they look so scrumptious?! I wanted the socks to have more of a winter vibe than a Christmas vibe, so I opted for a very blue and grey color palette. I colored the socks with Copic markers in the B, BG, and C-grey family. And obviously a winter card needs glitter, so I added some Silver Stickles throughout. I used kraft cardstock for the base and added the blue pattern paper from DCWV Winter Basics 6x6 pad. Since the socks are so detailed, I kept the card fairly simple. A little piece of white jute cord and some pearls finish this one off. I'm also excited to be (finally) linking up to the Christmas Card Challenge for the first time! This week is Anything Goes! Such cute stocking. I love all the blingy touches. Thanks for joining us at Christmas Card Challenges this week!! Love the stockings!! Such a cute winter card!